The adorable, cheeky and unforgettable chimpanzee from Africa. Young chimpanzees pull jokes on adults, play in piles of leaves and have to deal with ‘helicopter’ mums. Sound familiar? Well that’s probably because chimpanzees share almost 99% of the same DNA as “humanimals”. We have the same blood groups, diseases, physiology and in fact, are more closely related than chimps are to any other great ape. We also have the same emotions, bonds and in some ways chimps are even more intelligent than us. Chimpanzees are famous for their grooming habits. Grooming has a two-fold purpose: cleaning, and cementing the bonds of family and friendship. By running their fingers through each other’s hair, chimpanzees remove dirt, dead skin, and parasites. They will also clean any cuts or scrapes another chimp may have. Grooming is also the single most important social activity and takes up a lot of each day’s rest periods. Through these actions chimpanzees nourish friendships, comfort each other, and patch up disagreements. Chimpanzees used to live in 21 countries across Africa. Now they are only found in 12 countries (almost 10) and some habitats are so separated from each other that some groups of chimpanzees may not be able to last much longer. Their homes now stretch from southern Senegal through Central Africa to western Tanzania. Fifty years ago, there were probably a million chimpanzees living in Africa. Today, chimpanzees are an endangered species, with as few as 170,000 left in the Africa, and their population is decreasing rapidly. One recent census revealed that the chimp population have decreased 90% in the past 20 years. Much of what we know about chimpanzees started with our beloved founder Dr Jane Goodall’s groundbreaking work in Gombe, Tanzania almost 60 years ago. Dr Jane was the first to suggest that non-human animals had personalities and emotion, an idea that was not well received by the scientific community at the time! Now of course we know that chimpanzees are highly intelligent and have lots of emotions – some are cheeky, some are shy, most are quick to frighten or anger but all are quick to forgive. Perhaps further proof that we still have a lot to learn from them! Of course Dr Jane’s most historically significant discovery was the fact that chimpanzees make and use tools. Prior to this, humans were the only animals thought to be capable of this and in fact, this was part of what defined us as a species. That’s why Dr Jane is known as “the woman who redefined man” and why her work as a primatologist, woman and animal is so inspirational to so many. Sadly, despite being our most closely related species, chimpanzees are also going extinct due to human actions. But with your help, we’re going to change that. In fact most people don’t realise that chimpanzees are endangered and on the edge of extinction. 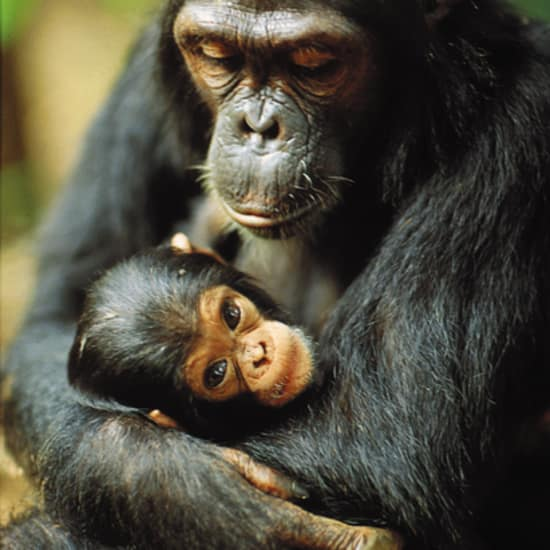 Every single subspecies of chimpanzees is categorised as endangered, which means that they face a high risk of extinction in the wild and future generations may only be saved in zoos. Removal of trees and selling chimpanzees as bushmeat or pets are the two biggest things putting chimpanzees on the edge. Twenty years after Dr Jane started her work with chimpanzees in Gombe Park, she had the opportunity to fly over Tanzania and only then did she realise the extent of forest and chimpanzee habitat loss. This was the driving force behind the start of the Jane Goodall Institute (JGI), which now has branches in 37 countries including Australia. Humans have pulled down a lot of trees that the chimpanzees relied on and this has played the largest part in the drastic decline of chimpanzee populations. Every year hundreds of chimpanzees are poached for the bushmeat and pet trade market. For example, poachers in Congo kill hundreds of chimpanzees each year for the illegal bushmeat trade. Sometimes they spare the lives of the smallest, selling them as pets and to the entertainment industry. The wildlife trade market is worth between $5-23B USD per year and one of the most lucrative forms of trafficking alongside arms, humans and illegal drugs. The Jane Goodall Institute works to end the illegal commercial bush meat trade through education and awareness programs, changing policy and community-centred conservation activities including development of alternate sources of protein. But, until demand for bush meat subsides, illegal hunting will continue. To help the youngest victims - the orphaned babies - JGI operates Tchimpounga Chimpanzee Rehabilitation Centre, a safe haven in the Republic of Congo, where orphans who have been confiscated from the black market can get needed care and attention. It was started in 1992 and today hosts more than 150 chimps and five years ago opened up three islands where chimps live in near-wild conditions. In 2012, we adopted an ambitious 30-year goal to protect 85% of Africa’s wild chimpanzee populations in their natural habitats. In conjunction with protecting habitat and educating the public, we also need to rescue as many wild chimpanzees as we can so that someday they can be released into the repopulated wild. We are losing wild chimpanzees at an increasingly fast rate so having a stable and strong population in our sanctuary will be critical to regaining numbers in the wild. So far we have saved more than 150 chimpanzees and we aim to bring about half of them back to the wild. At the Jane Goodall Institute’s Tchimpounga Chimpanzee Rehabilitation Centre, we provide a safe home for more than 150 young chimps orphaned by poachers and work on education and awareness programs to end the illegal wildlife trade. We have saved hundreds of chimpanzees, and are now working on program to release them back into the wild. 1. $10,000: This will help us with feeding young chimpanzees at Tchimpounga. Healthy chimps have healthy appetites and food costs per chimp are about $8/day for solids or $20/day for milk bottles. This $10K will feed 3-4 chimps for an entire year. 2. $50,000: This will help us with our public awareness program. We have a country-wide program to install 140 roadside billboards across the country for public education on poaching. So far, we have 80 installed. This $50K would allow us to install 17 new billboards in the centre of the country, where illegal wildlife trade is rife. We have seen great success of roadside billboards reducing the number of chimpanzees killed, as shown in the number of orphan infants in our sanctuary dropping by eight per year in only two years. 3. $100,000 +: What we’d really love to do is release chimpanzees back into the wild. We are currently doing detailed site analyses of our release areas and are perfecting our release program using another, smaller primate - mandrills. We have successfully released 12 mandrills already and have had great leanings from these releases that we will apply to our chimpanzee release program. The next step is to release another four mandrills from Tchimpounga and $100K would allow us to build new monitoring facilities at the release site and hire more field assistants. JGI are doing all of this work along with the help of local residents and government officials who are helping us catch poachers. We have been doing this work for a long time and are confident that we can save our amazing primate relatives. Donate directly to Jane Goodall Institute Australia.